Meet Hulagarish – Our Hospice Patience | Strong Hearts International, Inc.
Hulagarish is a wife. Hulagarish is a mom. Hulagarish is a cancer patient and Hulagarish is HIV+. Hulagarish’s body is responding to HIV the same way it has for fifteen years, it’s battling for survival, except now, the battle’s end is drawing near. Her body is meager, her hair is thin, and her shoulders are slumped, as if to say, HIV is winning. 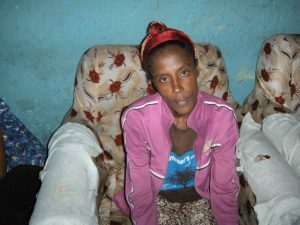 Hulagarish is desperately weak, her cancer wounds are severe, and she is uncomfortable daily. Our Hospice team visits her a few times a week and they do the best they can to provide basic nursing care, encourage her, and evaluate the progression of herillness. During the past few months the Hospice nurses have heard a consistent but heartbreaking message from Huluagerish, “I want to be with Jesus. I want to go.” While this is difficult to hear, it’s not a time to be sad. It is a time to praise God. Praise God that Hulagarish knows Him, wants to be with Him, understands the limited time she has on earth and is using her restricted time to talk about her “Abba,”Father. Today, I am thanking God for people like Hulagarish, people who have big faith in our big God!